Located in South Fayette Township, this community was selected “Multi-Family Community of the Year” in 1995 by the Builders Association of Metropolitan Pittsburgh and the Realtor’s Association of Metropolitan Pittsburgh. Selection was made by a panel of qualified judges recognized for their expertise in home building. From the moment you drive into the neighborhood, and past the lakes and clubhouse, you know why Lakemont Farms received this recognition. It is the epitome of balancing nature with development. This neighborhood includes custom-town home residences oriented around cul-de-sacs with unique identity and streetscapes. 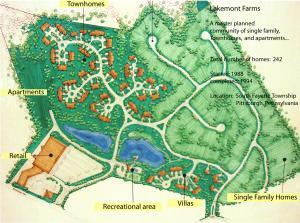 The comprehensive land plan includes a clubhouse, pool, tennis and sport courts, putting green and two lakes.